The Maritime Executive began publishing in 1997. Each edition features executives from around the world and a case study on their company. Today, the publication has become the largest business journal in the industry with 28,000 copies sent six times a year to 127 countries. In 1999, the MarEx Newsletter was published once a month and sent to just 1,000 readers. Today, the newsletter is published five times a week and is sent to more than 60,000 subscribers. 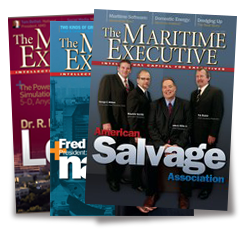 The Maritime Executive's website was launched in 1999 at www.maritime-executive.com, but it simply served as a platform for the magazine and newsletter. Today, the website is considered a news and editorial source for breaking news, opinions, videos and industry events. More importantly, both the newsletter and the website have become robust revenue sources for the company. The Maritime Executive aims to be the leading source of maritime news, jobs, events, and industry analysis. It intends to do so by enhancing its interactivity through continued investment in today’s most advanced technologies. In addition, the organization will continue to provide benchmarked research to executives – intellectual capital vital to operating their organizations. Providing free and easily accessible content will encourage growth in readership and create value for advertisers.